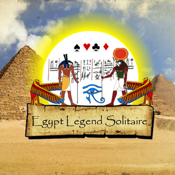 Feel the atmosphere of Ancient Egypt in this new colorful solitaire! The goal is to clear the playing board. Move two cards of the same rank to the foundation. If you failed to find the pair then click on the stack to get new open cards. Be attentive while choosing the pairs, pass from one level to another perfecting your skill. Each level is harder than the previous one. Solve the mystery of the ancient Egyptian civilization, discovery what majestic pyramids hide.